For as long as she could remember, Diva lived at 11 avenue Le Play in Paris, France. For as long as he could remember, Flea also lived in Paris, France-but at no fixed address. 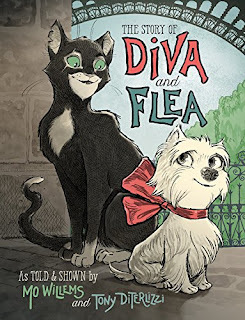 When Flea flâneurs passed Diva's courtyard one day, their lives were forever changed. Together, Diva and Flea explore and share their very different worlds, as only true friends can do. There's some cute aspects, a valuable lesson, and some spots of humor, but this is not my favorite Mo Willems book. In the story, both animals have their own fears to face. They help each other face them with courage and become better friends while doing so. But MAN, it was a tedious and somewhat boring process. I love Mo Willems, especially Elephant and Piggie, but I'm wondering if he should stick to books of that length. This one is longer and it drags. I actually had to take a break from reading it. Yes, a break from a beginning chapter book! Still, I appreciate the French vocabulary (perhaps a pronunciation guide would be helpful, though) and culture lesson, and the note at the end from Mo makes it touching—it's a personal story. But you know what really makes it? The illustrations are gorgeous. DiTerlizzi does a really great job with the emotions of the characters, the beauty of Paris, and keeps it true to the story. It just adds to the charming, romantic, Parisian feel of the book. Overall, I might not rush to recommend this book, but it definitely deserves a perusal. I'm glad to know this as I was considering buying it for one of my kiddos for Christmas. Thanks Emily!